Day 2 always the busiest or most tiring day throughout the trip (as for my experience), went to many places and I guess I'm gonna split it into more parts. Same with my parents, I normally woke up earlier to prepare everything we need, moreover the JR tour will come to pick us from hotel, we need to have our breakfast done before it. This doesn't apply on my sister and bro-in-law, sorry for pointed you out lol. We decided to have a walk around our hotel while waiting for both of them, to get some morning breeze. The street along Lee Garden Plaza wasn't that crowded compare to noon and night time, maybe it was still early and I noticed some of the shops are yet to open. Dad wanted to find a coffee shop to cure his caffeine need, too bad most of the shops were just started to open. 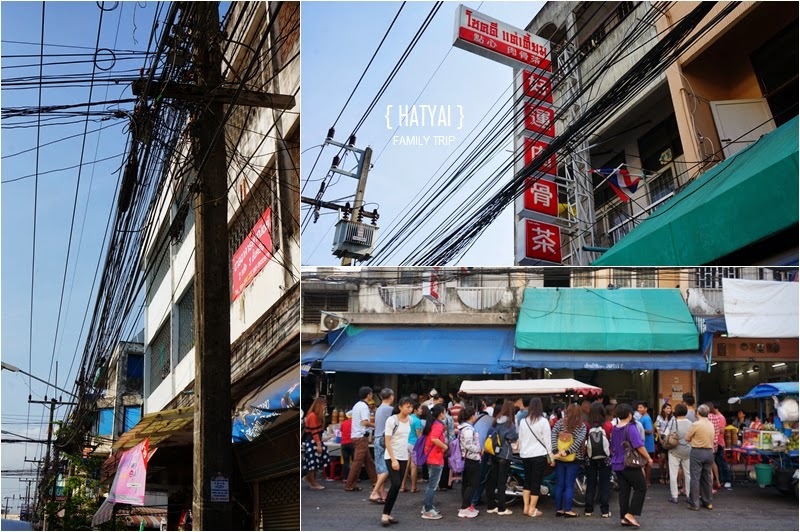 Heart the city which look like a palette, full of colors, who says Hat Yai is a small town, it is big enough for us to immerse ourselves in their culture and lifestyle. Met up with sister and bro-in-law at the hotel lobby and went to the famous breakfast place - Chokdee Dim Sum and Bak Kut Teh (好運點心肉骨茶); superb crowded you can see outside the restaurant. It was hard to control the chaotic crowds, you are lucky if you get your seat faster than other groups or if you come in a small group, you are easier to look for a table. All of us need to wait outside until boss and his staff clean up a table for you and give you your table number written on a piece of white paper. Mom and I decided to visit the nearby stalls while waiting for our turn to be seated. Fruits over here are cheap, if you have space in your luggage you can get some fruits back; if you don't want you can just get a big packet of sliced fruits at 10-20THB. We saw this cute tiny food at the stalls and decided to give it a try since we never try it before (I wanted to buy skewered chicken actually lol), baked glutinous rice in monkey cup topped with some coconut milk (20THB). The stall lady told us the monkey cup can be eaten, but I feel the taste is quite weird so we only ate the glutinous rice inside, we both finished 3 of these since others don't want to try. Unlike our dim sum here which are all steamed, heated and prepared upfront; theirs are yet to steamed or cooked. Once you have your seat, take the paper with your table number written on it and select your favorite food at their dim sum corner, each dim sum bucket cost 16THB (cheap!!! ); once you have done, put all the dim sum on the top of table, the staff will slip the white paper between dim sum bucket and use a divider to separate your dim sum. They will start to cook your dim sum accordingly and serve it to your table. We ordered more than 20 dim sum buckets, our table is too small and we can't put all the dim sum on our table, luckily the boss prepare a tray besides every table, so those extra thingy or unused dim sum buckets can put on top of it. We also ordered bak kut teh for 3 pax and it came in this big portion, we can't really finished all of them, those yummy one we still can sweep away. Overall the food was just okay, I still prefer the one in Penang, but the price is cheap and we paid only 700THB+ for this breakfast. Oh yeah, my dad had his coffee here finally, something I should say is their teh peng (iced milk tea) is really good! Can you believe it? For me, 7-eleven in Hat Yai become the best place to shopping, they have all sort of things with very affordable price. The collagen drinks just cost around 20THB but here I think they sell around RM17++ per bottle; whenever I passed by 7-eleven, I sure need 5-10 minutes to survey what to buy. Laugh! Don't feel to do anything today but I have outing lol. This post is so colourful and pretty!